I was reading the other day and came across the explanation we have all heard many times. 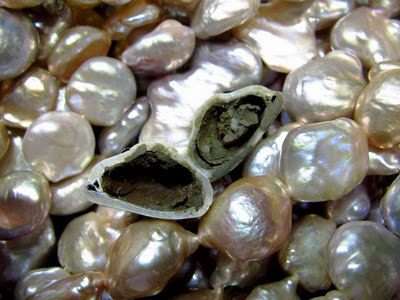 The explanation of how a pearl comes to be. Tonight as I was talking with a few friends of mine who were recounting their personal history and what God had delivered them from I was reminded once again of the story of the pearl. What hit me was that at the center of every pearl is the source of irritation. I have heard this analogy over and over in church. How God can take things in your life that are bad and turn them into something good if you let Him but what I had never thought of before and what I have never heard in a sermon on the subject is how the source of irritation is never removed. The oyster begins a process of covering the irritant with a substance called nacre as stated above. The same substance which creates the shell. The nacre is created from minerals in the oyster's food. The more nutrient rich the oyster's diet the stronger the shell. The closer we walk with God and live on a steady diet of His Word the stronger we will become spiritually. irritation. It cannot simply ignore it and move on. It must move it around on all sides so that the whole things is coated creating a beautiful smooth surface. We too must deal with those things that are irritating or painful for us so that God is better able to create something beautiful out of them. This is by no means an easy process but it is necessary. God will not force you to deal with such things but if you let Him he will let you see the pearl that is created from them. Those things in your life that have been a great source of pain. The things that seems to constantly surface and remind you of the irritation are the things that God turns into something useable for...the saving of many lives. Yet we constantly ask God to remove those things from us or to deliver us from them. Instead we should pray that God would use them for good. For His good so that many lives can be saved. We should value them just as the world values and pays a high price for pearls - irritants and all. They can become our priceless treasures! These pearls are the very things that God will use to help you connect with someone who needs His touch in their life. The common ground that will open the door of someone's heart to welcome in the Savior.